This 22 year old female sought routine treatment at a hospital dental clinic. 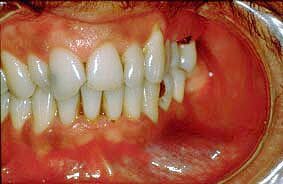 In addition to numerous caries, a diffuse bluish compressible slightly elevated mass was noted in the mandibular left mucobuccal fold. Slide 1 (medium power, H&E). 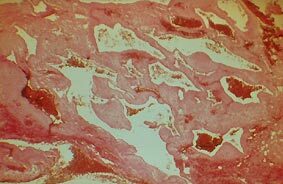 There are variously sized endothelium-lined vascular channels, some of which are filled with blood. 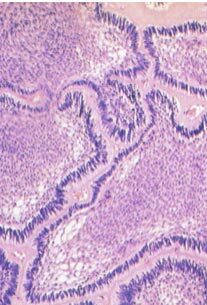 These vessels are supported by a dense fibrous connective tissue stroma.